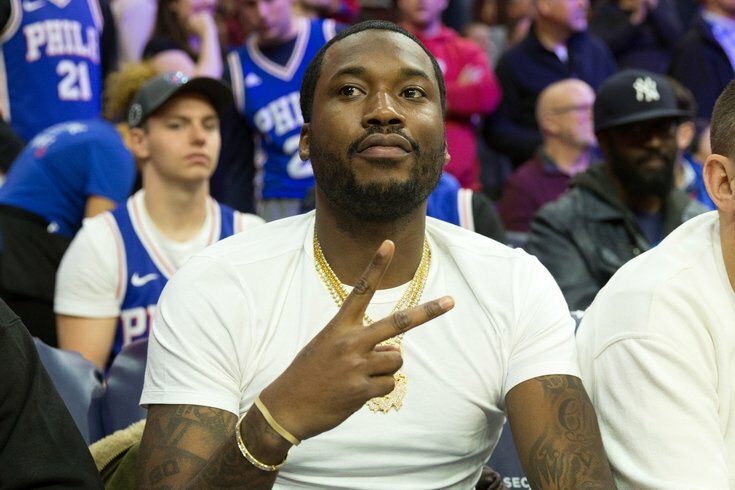 "Meek will come home," the attorney representing jailed rapper Meek Mill proclaimed Tuesday afternoon. Speaking before a criminal justice forum held Tuesday at the University of Pennsylvania, Joe Tacopina said the rapper's case is representative of an unjust system that leaves people in prison for technical violations. Tacopina also updated his efforts to free Mill, who is sitting in a state prison in Chester, Delaware County, for violating probation. "Fifty percent of the jail population is made up of people who commit violations of probations – not violent felony assaults or things of that nature," Tacopina said. "That creates the situation we have now. We know about it because Meek is Meek. But if Meek was Robert Williams and didn't have a rap career, that would be the end of that." Tacopina addressed more than a dozen reporters as hundreds of supporters gathered inside Irvine Auditorium to discuss criminal justice reform, including Eagles star Malcolm Jenkins and championship boxer Bernard Hopkins. 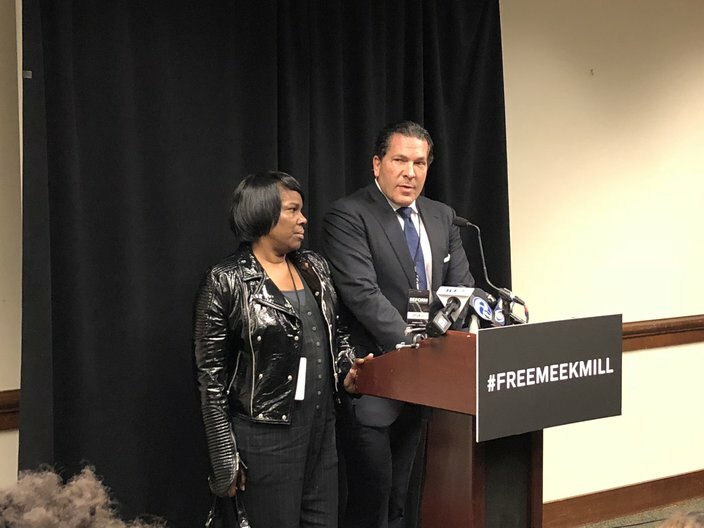 "No matter what, at the end of the day, this case is going to do good," Tacopina said, standing behind a podium adorned with a #FreeMeekMill placard. "And Meek understands that. He's going through something right now but he understands it's for the greater good. Because he's going to be the voice for the voiceless. "He's going to make change. That's what tonight's about. It's about reform. It's about putting a spotlight on a system that needs fixing." Mill, 30, a Philadelphia native, has been incarcerated since November for violating his parole agreement. Philadelphia Common Pleas Court Judge Genece E. Brinkley sentenced him to 2 to 4 years in state prison, citing a failed drug test and his noncompliance with a court order restricting his travel to Pennsylvania. But the punishment proved controversial, with social justice advocates decrying it as unusually harsh. As Mill sat in prison, his supporters staged a rally outside the Philadelphia Criminal Justice Center, drawing hundreds of protesters to Center City. Tacopina said there are felons who don't receive prison sentences that lengthy, calling Mill's situation "probation on steroids." Mill's mother, Kathy Williams, urged Philadelphia District Attorney Larry Krasner to intercede, noting there are many families going through similar situations. "Now, it's just like time to stop all the unjustice stuff that the system is doing out here to all these people," Williams said. "Millions of people – not just my (son). ... Don't just put them in the system like they're dogs or something. They're not. They're human beings, too." Williams, Tacopina and the Rev. Al Sharpton later addressed the forum, dubbed "Reform: Bringing Injustice to Light." They criticized Brinkley not only for the sentence she handed Mill, but also for her conduct, claiming she encouraged Mill to leave his label to join another run by her friend and has threatened to sue him. "We will make sure this perversion of justice is overturned, " Tacopina told the crowd, eliciting applause. "Meek will come home." Tacopina later dialed Mill and placed him on speaker phone, allowing him to address a crowd of about 2,000 people. Mill thanked the crowd for their support, saying he's not just fighting for his own freedom, but those of other people unfairly treated by the criminal justice system. "I'm happy to shed light on a situation that we've been going through for years," Mill said. "God picked me to be the one to bring the light to Philadelphia, Pennsylvania." Mill was arrested twice in 2017 – once after an alleged altercation at St. Louis International Airport, and again for popping a wheelie on his bike in New York City. Those arrests violated Mill's probation terms, which stem from a 2008 firearms conviction. But that conviction has come under fire in recent weeks. The arresting officer in that case –Reginald Graham – appeared on a secretive list of police officers that the Philadelphia District Attorney's Office considered untrustworthy. The list was compiled under former D.A. Seth Williams, who has since been convicted of corruption. It urged prosecutors not to call the police officers as witnesses, alleging the officers had displayed a history of dishonest behavior or racial bias. Graham was investigated by federal authorities for several alleged acts of corruption stemming from a November 2013 incident. That incident came five years after Graham appeared as the sole witness during Mill's 2008 trial. Mill attorney Peter Goldberger has filed a motion to overturn the rapper's conviction and grant him a new trial, alleging that Graham lied to put the rapper behind bars. That claim is based on a sworn affidavit provided by former Philadelphia police officer Jerold Gibson, who alleges Graham's testimony doesn't reflect what happened during Mill's initial arrest as an 18-year-old. According to Gibson, Mill never pointed a gun at police, as Graham attested. He said Graham never sought cover behind a parked van, and that Mill never tried to escape. Mill served eight months in prison following his conviction, and was sentenced to another five years of probation, which was later extended. In 2014, Mill served five months in prison for violating his probation by performing outside of Pennsylvania. And he was sentenced to 90 days of house arrest after another violation in February 2016. Jenkins – one of the many NFL players who have advocated for criminal justice reform – called for a move away from punitive sentences aimed simply at imprisoning people for long periods of time. "He was sentenced two years for popping a wheelie," Jenkins said of Mill's sentence. "It's an example of just how ridiculous sometimes our system can be and how we're wasting resources, talent, money and locking people up for things that don't make our communities safer." Hopkins, who served five years in prison as a teenager and young adult, said there are many people serving unfair sentences for minor mistakes. "I understand everybody is not innocent," Hopkins said. "I'd be a fool if I tell you that's everybody out there. But there are those that got caught in the system unfairly because of their lack of support, and lack of communications amongst what's best and what's not for them."